Wondering what you’ll find at 2018’s two-day extravaganza? Here’s a closer look at the food and fun waiting for you in Newport this October 13th and 14th. What more suitable setting for a celebration of all things seafood than Newport’s historic Bowen’s Wharf? Honoring the region’s extraordinary “harvest of the sea,” local restaurants and fishermen’s associations come together under the tents to serve up a beautiful bounty of the ocean's amazing treasures, including lobster dinners, clam chowder, calamari, stuffed quahogs, clam cakes, shrimp, scallops, raw oysters, clams and much more. But landlubbers and sweets seekers aren’t out of luck: They’ll also find ample to sample at the event. There's fresh smoothies, donuts and kettle corn for those that don’t enjoy seafood. Fancy a signature cocktail with your lobster tail, meanwhile? Beverage options include plenty of cold Whaler’s brewing beer. Fish may swim and crustaceans may crawl, but humans love to dance. And you’ll find plenty of reason to shake a leg (or fin, as the case may be) thanks to a lineup of bands on both Saturday and Sunday, including everything from surf rock and reggae to cool jazz and rock & roll. Saturday performances include The New40 Soulful (Groove with a twist) from 11:00 am - 1:00 pm, Cee Cee & the Riders (West Coast + Chicago Blues) from 1:00 pm - 3:00 pm and Chelley, Bill & Dyl (Jazz, R&B, Country) from 3:00 pm - 6:00 pm. Sunday performances include The TeleDynes (Surf Rock) from 11:00 am - 1:00 pm, White-Eyed Lizard Band (Caribbean) and The Copacetics (Reggae + Ska) from 3:00 pm - 5:00 pm. Proceeds from the festival bars benefit the Oliver Hazard Perry, the 200-foot official sailing vessel of Rhode Island. The ship was the first ocean-going full-rigged ship to be built in the U.S. in 110 years. More than 40,000 visitors were able to tour the ship and learn all about its education-at-sea-mission. Your contributions will be going to a wonderful cause that will allow future generations to receive this education as well. The Nature Conservancy of RI will also be around throughout the weekend making sure that all recyclables, compostables, shells and trash are disposed of in the most planet-friendly way. 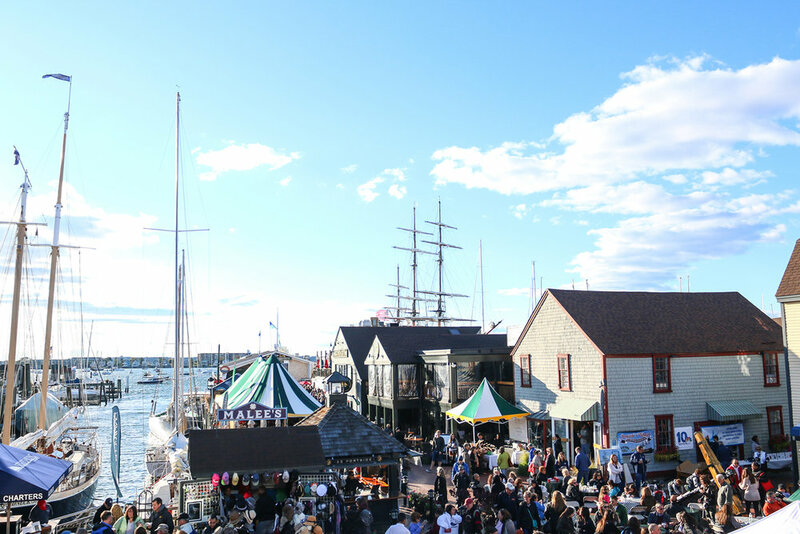 There’s a reason why thousands of revelers head to Newport every year for this free (yes, you read that right) event. And since you can’t spend the night “under the sea,” why not lay your head down in the next best place? Limited availability remains at The Chanler at Cliff Walk so be sure to book your stay as soon as possible.